Rev. 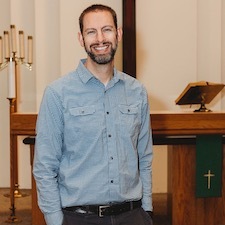 Aaron Schellhas was installed as Immanuel's pastor on Sunday, January 13th. He was most recently the pastor at St. John's Lutheran Church in Woodstock, Illinois. He grew up in Holt, Michigan and attended Concordia University, Chicago, receiving a Bachelor of Arts in both Church Music and Theological Languages. He attended Concordia Seminary in St. Louis and graduated with his Master of Divinity in 2008. Pastor Aaron met his wife, Leeann, during their undergrad years. They married in 2003 at Immnauel Mokena and have three children. Their family goes by the moniker Schell5, and they share a love of all things Disney and enjoy playing games together. Nicolette joined the Immanuel staff in December 2018. She grew up in Chicago’s southwest suburbs, and currently resides in Mokena along with her husband and their two young sons. She has a degree in Visual Communications from the Illinois Institute of Art and enjoys finding time to use her graphic design background along with her hobbies of photography, painting, and baking. Dale and his wife, Kathy, have been members at Immanuel since 1997, the same year Dale became the organist for the congregation. He has a bachelors degree in music performance and a masters in music education. With his background and education, he is a perfect fit for coaching instrumental soloists and occasionally filling in for the choir director at rehearsals. Dale enjoys fishing and remote control airplanes in his spare time, and he and Kathy have two daughters. 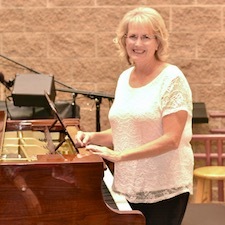 Nancy has been choir director at Immanuel since 1984 and became music coordinator in 2007. She holds a bachelor of arts degree with an emphasis in choral music education and a master of arts degree with an emphasis in piano instruction and vocal performance. She held various teaching roles through the years, most recently at Marion Catholic H.S. in Chicago Heights; she retired in 2002 after teaching music there for 12 years. She and her husband, John, have two children and three grandchildren to help keep them busy. Her hobbies include gardening, reading mysteries, and knitting. Linda joined Immanuel's staff in November 2017 as preschool director. Her prior experience includes the position of preschool director at Grace Lutheran Preschool in Wilmington and preschool teaching experience at Peace Community Preschool in Frankfort. Linda and her husband Ray have two sons and three dogs, and she enjoys hiking, mountain biking, and traveling with her family. Her favorite bible verse is Matthew 17:20.